On November 20th, the Genders and Sexualities Alliance Club, G.S.A, had their first meeting. The club has meetings every monday after school for 1 hour where everyone is welcomed and can have snacks, play games, plan fundraisers, pride activities, and talk to people about their sexuality and gender or ask questions openly and safely within the club, while spreading awareness for the LGBT community in Fraser. “Our club is about making people more aware of the LGBT community and hopefully get them to understand it more and be a tad bit more accepting. Everyone is welcome, so it’s really diverse,” said Riley Woods, the G.S.A president. Riley Woods is a 15 year old, sophomore and is new to the school. When they came to the school, they were surprised that Fraser didn’t have a G.S.A club, and they wanted to create a safe place for others where they can be themselves. “I made this club because at my old school, GSA was one of the few places I felt really welcome where I could be myself and nobody would judge. I thought that we could use something like this, a place where people can just come and talk about how their feeling and what they’re going through,“ Woods said. The club has weekly discussions about relationships, family plans, and about the members future. In the first meeting,the club went over ideas of activities they want to do, made posters to promote their club, played an ice breaker game, had snacks, and plan on making it a safe and comfortable environment for everyone. “Having this club is honestly amazing. I have a good home life myself, but I know that some people don’t. Like some people in the LGBT community don’t and even people who aren’t in the lgbt community, that are just allies, they can come to the club and talk about why the support and that they do support and it’s a really nice club because its a safe place for LGBT people,”said Jessica Burke, an openly gay sophomore that’s a member of G.S.A. Jessica Burke was nervous to come to the club, but she loved the first meeting and felt welcomed and comfortable. “I’m normally an awkward person, but like at the club when I was there, even around people who like I don’t really know at all except for like one person, I felt comfortable there, and I don’t feel comfortable even in my own house sometimes, because that’s just me, but I really liked the meeting and it was nice,” Burke said. G.S.A advisor, Ms. Smith, who teaches english, hopes to make the club a welcoming environment that is fun and accepting of everyone. “Anyone is welcome if you want to come,and you don’t have to associate with any sort of gender or orientation. You can be gay, straight, bi, or whatever, and join the club. It’s really fun,” said Ms. Smith. 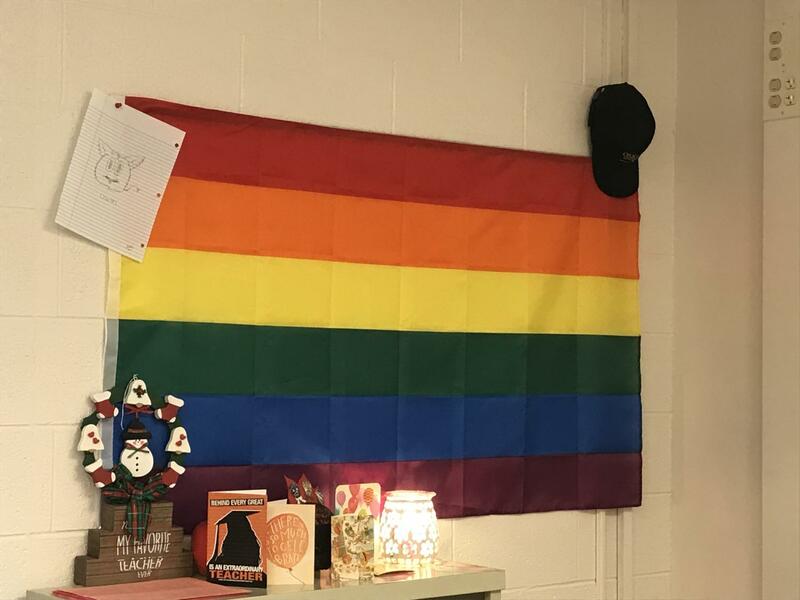 Besides being a safe and fun environment for everyone, the club also hopes to teach people about the LGBT community and spread representation for the lgbt community in Fraser High School. “I want to educate others on the LGBT community and everything going on in the world making it hard for us. I hope the club gets more popular among students in a positive light. Our main focus is to make the Fraser community a better place,” Woods said. The club also helps people who have questions about the community and have somewhere to ask about their sexual orientation or gender. “Our club is about making sure that everyone in Fraser high school has a safe place to be, no matter their sexual orientation or gender might be. Especially if someone has questions about that like what their gender might be or if their unsure or if they want a space to explore that kind of stuff. Like rather or not they want someone to talk to about gender exploration or sexual orientation exploration we want a place where you can not only meet other people who have these issues and want to talk about them or with people who don’t have these issues and can help someone with them,” Smith said. Woods has been working really hard on making it a place with various of people and help everyone in the club. “This club means so much to me, it’s gotten me through so much in the past, I just want to create that same safe space for other people. I’m working really hard on making it a diverse, safe place for people to come to,” Woods said. The club has already become a strong LGBT representation in the school and has brought lgbt members and allies together. “Personally, it just means representation where we can bring our community together. It just really means good representation for the community and for the allies and where we can speak out and be heard. Also show people that we are just the same as them it’s just we like the same gender or we are just a different gender than what we were born as,” Burke said. G.S.A hopes to be a club that grows more with new members and help everyone in the LGBT community in Fraser. “It’s great that I am helping students, not just with their essays and academics, but helping them discover who they are as a person and how that affects the rest of their life, and go about handling themselves in their life, because when you’re unsure about something I feel like it kind of affects everything that you do. It makes every step you take seem scary and even if it is scary and even if you don’t know, just knowing that other people don’t know too makes you feel better. I think that’s half the battle kind of, and having someone help you say oh well this is how i felt or this is what I did and it helped me, and just having a support network of people who can help is just awesome I think,” Smith said. G.S.A is a community in Fraser High School that is safe, accepting, and represents the LGBT community. The club has meetings after school, every monday, and hopes that the club gains more members and becomes a welcoming atmosphere for all.